San Francisco, CA, August 1, 2018 – VIZ Media, LLC (VIZ Media), a premier company in the fields of publishing, animation distribution, and global entertainment licensing, delivers a heartwarming story about love and friendship with the new shojo manga series SHORTCAKE CAKE on August 7th. The series will be published in print under VIZ Media’s Shojo Beat imprint with an MSRP of $9.99 U.S. / $12.99 CAN. SHORTCAKE CAKE will also be available digitally on August 7th via viz.com and the VIZ Manga App, as well as from the Nook, Kobo, Kindle, iBooks, comiXology, and Google Play stores. Future volumes of the series will be published on a quarterly basis. SHORTCAKE CAKE was created by a manga duo known under the pseudonym, suu Morishita. In 2010, they debuted with the one-shot, “Anote Konote.” Their other published works include Hibi Chouchou and SHORTCAKE CAKE. 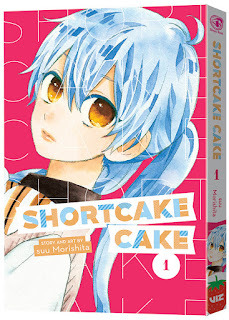 For additional information on SHORTCAKE CAKE and other anime and/or manga titles distributed and published by VIZ Media, please visit viz.com.